The two or three people who still read the blog will of course be aware that posting frequency has dropped considerably over the past few years. The main factor behind this is the fact that after a while, pretty well everything that one can say on the issue from a scientific and theological point of view has already been said, and further posts run the risk of being repetitive. Given this, I have been striving for quality rather than quantity. In 2001, the Discovery Institute, an advocate of the pseudoscience of intelligent design released A Scientific Dissent From Darwinism to which a small number of people of varying professional backgrounds had given their assent. The statement, which professed scepticism of the ability of random mutation and natural selection was widely criticised in the mainstream scientific community on many points including its misleading phrasing, designed to make the layperson think criticism of a subject implied wholesale rejection, as well as its straw man presentation of modern evolutionary theory as simply random mutation and natural selection. Recently, this statement has been popping up across the Christian world due to the fact that this list has now managed to garner 1000 signatories. Despite the fact it has been ably demolished,  another ritual flogging would not go astray. Appealing to Mark 10:6-8 doesn't mean there aren't two divergent creation accounts. Outside of the extremes of fundamentalist Christianity, there is a strong consensus that Genesis 1 and Genesis 2 are two separate creation accounts which when read literally differ significantly in terms of the duration of creation, order of events, and the nature of God as revealed in how he is described as creating. One common fundamentalist attempt to argue away this problem an appeal to Mark 10:6-8, where Jesus quotes from both Genesis 1 and Genesis 2. Their argument is that by quoting from Gen 1 and Gen 2, Jesus is showing that he believed the accounts were not in tension. This is of course patently unconvincing if only because the differences between the creation narratives are not resolved simply by appealing to the NT passage. Context is also important as the point being argued was divorce rather than creation. One common theme in deconversion stories is the loss of faith when the former believer discovered that contrary to what their faith community had dogmatically asserted, the evidence for evolution was in fact overwhelming. Unfortunately, one of the biggest reasons behind the perception that evolution and Christianity are utterly incompatible is the doctrine of Original Sin, in both its Reformed and Catholic forms. The fundamental problem here is of course the fact Original Sin requires every single human being to be exclusively descended from two people in order for the physical change in human nature that adherents of Original Sin believe happened as a result of Adam's sin to be genetically transmitted to the entire human race. Given what we know of the origins of the human race, this is of course impossible as the size of the human population has never been lower than a few thousand people, while humans and chimpanzees share a common ancestor that lived around six million years ago. Original Sin demands a view of human origins that cannot be reconciled with hard facts. In a recent article  at the Recovering from Religion blog Ex-Communications, Suze Ambs writes on how discovering the truth about evolution helped erode her faith. While she states that there were many reasons for her deconversion, in this article she points out how the scientific evidence for human evolution was the "nail in the coffin" for her belief because it directly undermined Original Sin and the atonement theory based on it. Ambs' observation is hardly isolated, with other ex-Christians also pointing out how evolution destroys the anthropology of Original Sin and any atonement theory based on it. As such, it is worth looking at her article in some detail, if only to show just how dangerous to faith evolution denialism and Original Sin are. Flat Earth Creationists and Firmament Denialism - Why flat earthers are the only truly consistent biblical literalists. Flat earthers it seems are everywhere at the moment. A movement that one would imagine would have not survived the launch of space probes has not only managed to survive but thrive. One thing that many overlook however is that most flat earthers are united by their adherence to Biblical literalism. For them, the literal word of the Bible is the ultimate authority, and they are convinced that a literal reading of the Bible teaches a flat earth covered by a solid firmament. One may regard their denial of the last 2500 years of science as beyond insane, but they at least deserve credit for being consistent in their literalism. Conventional YECs and even geocentrists, both of whom also claim to take the literal word of the Bible as their ultimate authority in reality reject a literal reading of the Bible when it conflicts with their belief in a spherical Earth, leaving them rightly open to the charge of selective literalism. "How is evolutionary creationism consistent with the Bible?" is a question one hears from people who accept the fact of evolution, but wonder how the Biblical statements on creation can be harmonised with the modern scientific understanding on how the diversity of life appeared on this planet over its 4600 million year history. The short answer is that the Bible teaches who created the universe, not how. To that one can add that it is vital to grasp the concept of Divine agency where something is ultimately attributed to God, even though the actual nuts and bolts of how it was achieved can be explained by a secondary process. Finally, it is important to understand that God accommodates pre-modern views on the nature of the universe, rather than try to teach a scientifically accurate (by modern standards) view which would have been incomprehensible to a pre-scientific audience. Ultimately, there is no need to ask how to harmonise any aspect of science with the Bible as that is immaterial to its main purpose. 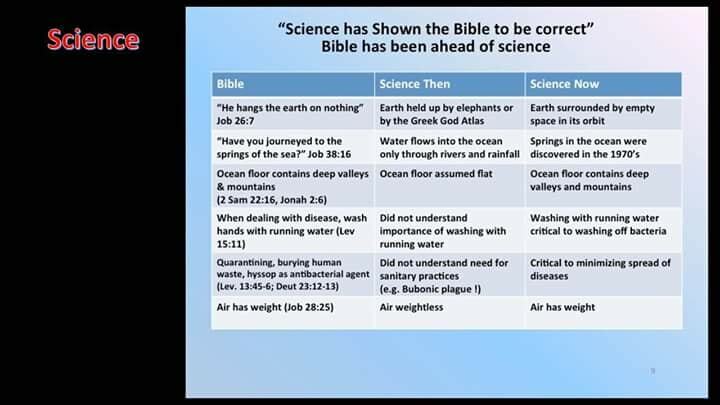 Recently, a creationist meme attempting to show that the Bible has always been ahead of science by comparing "Science Then" and "Science Now" with selected statements from the Bible has been circulating around the more fundamentalist parts of the internet. It is frankly depressing that something this risible is taken seriously by a large number of Christians. Just the lack of references for any of the "Science Then" claims should be enough to destroy the credibility of this meme as there is absolutely no way to verify these references. However, despite a number of debunkings, [1-2] fundamentalists still persist in sharing the meme. That past debunkings have not been able to put this ridiculous meme out of its misery suggests that yet another one is hardly likely to be successful, but given that this meme is circulating in our community and 'in-house' debunkings are slightly more likely to be successful, there is some justification in spending time putting this meme once again to the sword. Quirks of Human Anatomy: An Evo-Devo Look at the Human Body - Lewis I. Held Jr.
No, Exodus 20:11 is not proof for creation in six literal days. Here's why. Creative Commons Attribution-NonCommercial-ShareAlike 3.0 Unported . Picture Window theme. Powered by Blogger.